Our doors are always open to anyone without a place to call home. Sometimes life doesn’t turn out how we planned. Our emergency, transitional or permanent housing options across the Midwest can help. At The Salvation Army, we have an open door policy when it comes to those needing help with housing - whether they need a place to rest their head inside our doors or need help finding a way to stay in their own home. All are welcome, and every night, we help thousands of men, women, youth and children sleep safely and dream of a better tomorrow. Only about 15 percent of the homeless population is comprised of "chronically homeless" individuals. Homelessness can happen to anyone - single men, single women, entire families, the elderly, children or young adults. No one population is immune. Anyone of us could be one cancer diagnosis, financial crisis, or house fire away from needing our help. That's why our doors are always open, and we embrace all who walk through them. Everyone is welcome to come to The Salvation Army to get out of the bitter cold, intense heat, heavy rains, or just to have a safe and quiet place to spend the night. With every bed also comes a nutritious meal and a clean shower. We operate shelters across the Midwest for single men and women, with some areas able to accommodate young adults and families. When you need a place to stay during the “in-between,” our transitional housing program offers shelter until you find a permanent place to live. If you’ve been evicted, are dealing with an addiction, face a domestic break-up or have another type of housing crisis, contact your local Salvation Army to find out what transitional housing options are available in your area. We offer temporary housing and support services for up to six months to low-income, single men and women, and some areas are able to accommodate young adults and families. When you don’t know where the money for your next rent payment is coming from, check with your local Worship and Service Center to see if funding is available for rent assistance. This type of funding ebbs and flows, but if we can help, we will. During a long, cold winter, your heat bill swells and you receive a notice from your energy provider that all utilities will be disconnected unless you can pay the overdue balance. Or, maybe a job loss forced you to choose between paying rent or paying your electric bill. You chose rent and just received an electric shut off notice. We can help. In the Midwest, the weather can be unpredictable. The homeless population is most vulnerable during the hottest and coldest months of the year. 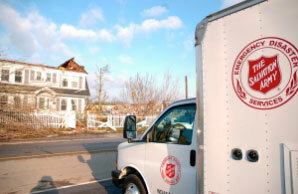 Many times extreme weather can even be life threatening for those without a place to seek shelter. This is why we open our doors to become cooling and warming stations to ensure the safety of these individuals when it's needed most. We have partnerships with companies who donate fans to distribute to those in need of a refreshing breeze in the summer. Sometimes we are even able to provide air conditioners to those whose health is threatened by the heat. Contact your local Salvation Army to learn if this service is available. Our holistic, multi-faceted programs meet families where they are in life - and many are even homeless. We work with them to identify obstacles and set short-term and long-term goals, which includes finding stable housing to build hope as they move forward. We believe that the foundation of a family remaining together and moving forward together is paramount. Give now to provide the warmth of home.